It's been a while since the Oscars 2009 were shown but I just had to show you all this. It's a Musical's Are Back inspired Medley of Show Tunes from famous Musicals. Performing the Baz Lurhman arranged piece are Hugh Jackman, Beyonce, Dominic Cooper, Amanda Seyfriend, Zac Efron and Vanessa Hudgens. Take a look - it's epic! JoJo performs new song on MySpace. Kelly Clarkson talks about her new album. Catch Kelly Clarkson above talking about her new album "All I Ever Wanted" - out March 9th! Will you be picking up "All I Ever Wanted" ? Rihanna has seen an increase in US sales of her Good Girl Gone Bad album following the recent press coverage of her alleged altercation with Chris Brown. Sales of the 20-year-old star's third LP have surged by 31% amid allegations that she was attacked by Brown. The record has risen to 31 in the US Billboard Album chart, while Chris Brown's 2007 album Exclusive failed to register in the Top 200. Meanwhile, the singer's collaboration with T.I. 'Live Your Life' is at number 16 in the Billboard Hot 100, with solo single 'Disturbia' at 33. New Ayumi Hamasaki album coming soon! Flo Rida breaks U.S. Billboard Record! Flo Rida breaks his own record for most weekly digital song downloads as "Right Round" debuts at No. 1 on Billboard's Hot Digital Songs chart with 636,000 units, according to Nielsen SoundScan. The total smashes the mark he set with "Low" (467,000) in the January 12, 2008, issue, which took into account sales from that season's post-Christmas week. The tally for "Round" also surpasses the opening-week download record set just last week by "Crack a Bottle" from Eminem, 50 Cent & Dr. Dre (418,000). Teairra Mari - Hunt 4 U [Live! ]...any thoughts? Black Eyed Peas prep new album. Black Eyed Peas have confirmed details of their fifth studio album The E.N.D. The record, which is the hip-hop collective's first since 2005's Monkey Business, will be released in June on Interscope. It will be preceded by the lead single 'Boom Boom Pow', according to Billboard. will.i.am, Apl.de.ap, Taboo and Fergie are currently plotting an international tour to promote the disc. Speaking about the album's sound, will.i.am said: "[There will] be a lot of dance stuff, real melodic, electronic, soulful. We call it, like, electric static funk, something like that." ...any thoughts on the video ? Do u like the video? Santogold changes name to "SANTIGOLD"
Santo Gold – also known as Santo Rigatuso, or even allegedly as Bob Harris – still made use of the movie, inserting clips into infomercials for his jewelry business. Kelly Rowland to be new X-Factor judge? Amid rumours that Dannii Minogue is leaving the X-Factor as a judge, it's been widely reported in the UK papers that Kelly Rowland will replace Dannii for the 6th season of the X-Factor. Although Lily Allen, Victoria Beckham and Charlotte Church have been names bounced around - it is Kelly Rowland who is hotly tipped to replace the beautiful Dannii! ...do you want Kelly to replace Dannii ? Jimmy Jam to work on new Janet "project"
Check this video of Jimmy Jam talking about his new projects with producing partner Terry Lewis. Jimmy + Terry have collaborated with Janet for nearly 25 years and Jimmy revealed that they will be working with Janet again on a new project! Hopefully a new album after last year's "Discipline". Can't wait! 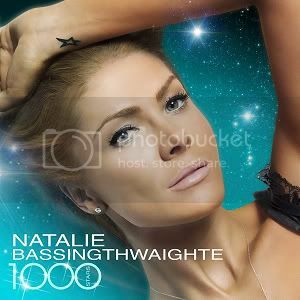 Here's the official cover and tracklisting for Natalie Bassingthwaighte's debut album. Make sure you buy when it's out on Feb 21st! The next single from Lady GaGa's smash hit album "The Fame" is "Eh, Eh (Nothing Else I Can Say)". The Italian-inspired video can be viewed above - check it out! YOUR THOUGHTS ON THE NEW VIDEO ? WHAT DO YOU THINK OF THE VIDEO/SONG? "Gravity" is the third single from Sara Bareille's "Little Voice" album. Check out the video above! All Saints are a British Girl Group which made it huge in the 90's and early 00's. They soon faded out but attempted a comeback in 2006, and are currently working on a 4th album to be released this year *hopefully*. Their sound was very unique and one of their highlights in their discography was "Pure Shoes". It was the theme to the Leonardo DiCaprio film "The Beach" and was co-produced with William Orbit. Take a look and enjoy today's Blast From The Past. What are your thoughts on All Saints? Ciara is back! Her comeback single "Never Ever" features Young Jeezy and you can see the video for the track above! It's very Janet Jackson inspired if you ask me ;) take a look! What did you think of the performance ?